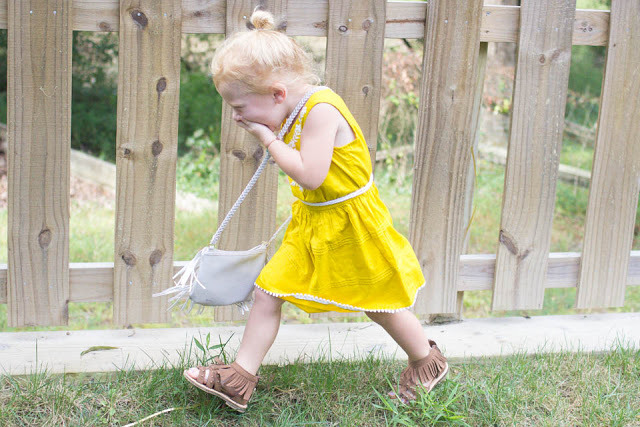 Either way, I thought I would round up some of my favorite looks for the little ladies and older ones, too, what better way is there to kick off a new week?! PS – Did you all see that CHRISTMAS jams are already out at the Gap?! I want to hate it but I think I love it. 🙂 These are similar to one of my favorites that Waverly had a few years ago, they are already sold out in some of the sizes! TGIF friends, I hope you all had a wonderful week! It’s been a crazy one our way, with two trips to the pediatrician in three days, the first time because both girls got pink-eye (helloooo two kids! ), and the second to get some relief from Avalon’s reflux, which seems to be getting worse. Waverly used to be crazy shy around our doctor and not say a word, but now that we have seen her so much lately, they are pretty much besties. She told her that Bogger (our dog) ate her bagel, that her newest baby doll’s name was Debbie & that she needed a band-aid, and that we just left dance but the lights weren’t on because her Miss Gita (her teacher) was taking a nap. The lights part was true. I got Waverly dressed in her tutu & leotard, packed both girls in the car and drove us all the way to dance, got them both out of their car seats and walked to the door – only to realize that the place was completely closed since the last day of summer dance class was last week. Yep, we are very ready for the weekend (and thankfully, just in time, both girls eyes are back to normal & Avalon seems to be doing better, too!). 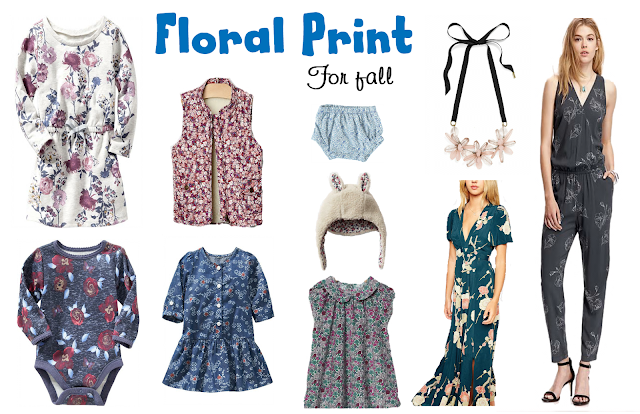 In other news, fall fashion!! 🙂 I love so many things about getting dressed in the fall, and my favorite part might just be bringing boots back! 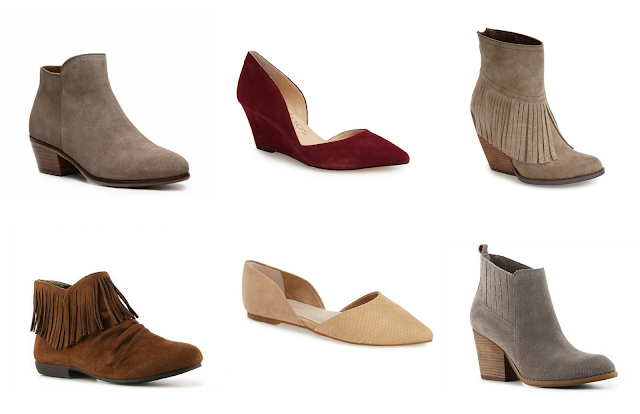 I have such an obsession with booties, I would wear them year-round if I could. I think they are such a great way to be stylish but comfortable at the same time. I’ve found some of my favorites for this year (all under $100), as well as a wedge & flat for some versatility, if booties aren’t your thing. Those fringe ones with hidden heel might just be my pick to add to my collection this year, how cute would they be with a floral dress before it gets really cold?! I also love this hat, which could be paired with any of the shoes (or really, anything you put on!) all fall long. Such a good price! 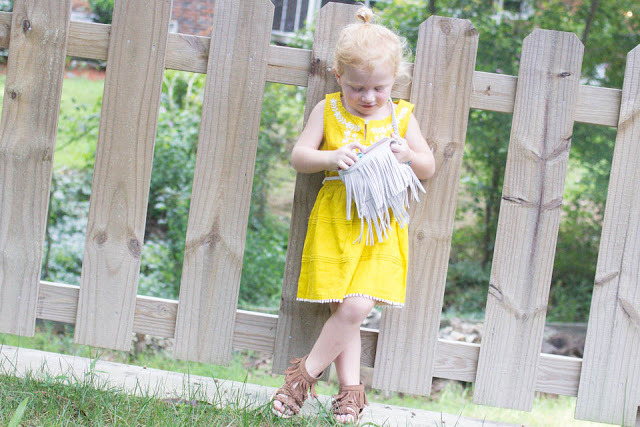 And since it’s still way too hot here to wear anything fall-appropriate, we will just pretend with fringe & fall colors! I can’t even take Waverly’s little pose in the top picture, I feel like I am looking into my future with (two) teenage daughters. 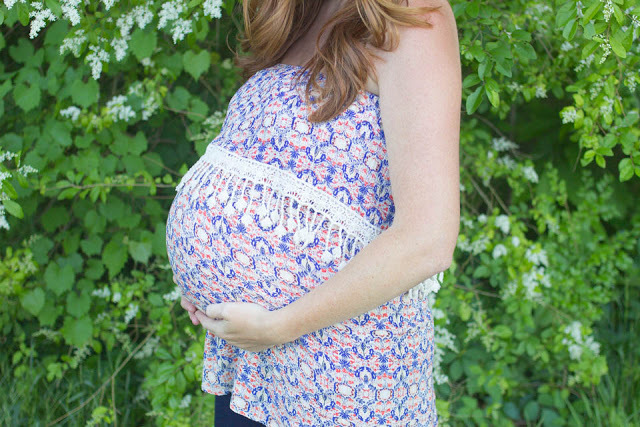 One of the things that I have tried to be better about this pregnancy has been staying true to my personal style. I’m sure others can relate, the first time around I was all about doing things by the book & that included fashion, I bought pretty much all the clothes that I wore from traditional maternity stores because I just figured that was what you did when you were pregnant. Most of them looked nothing like me at all, I wouldn’t have worn them pre-pregnancy, & I definitely didn’t want to wear them afterwards. Round two, I have gotten more creative with pieces I already had, with non-maternity clothes that can accommodate a growing belly, & with a few maternity pieces that I truly love and still make me feel like me. 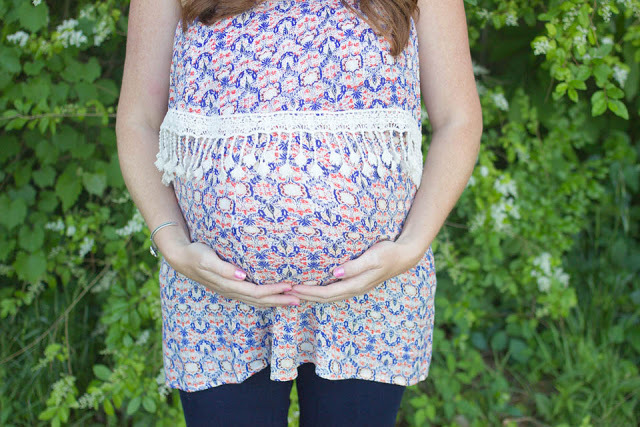 Pink Blush reached out to me a few weeks ago to review a few of their items, & I honestly was a little hesitant at first since I was still pregnant & would have to look at the maternity line, and I wasn’t sure if I would find anything that I would normally wear. 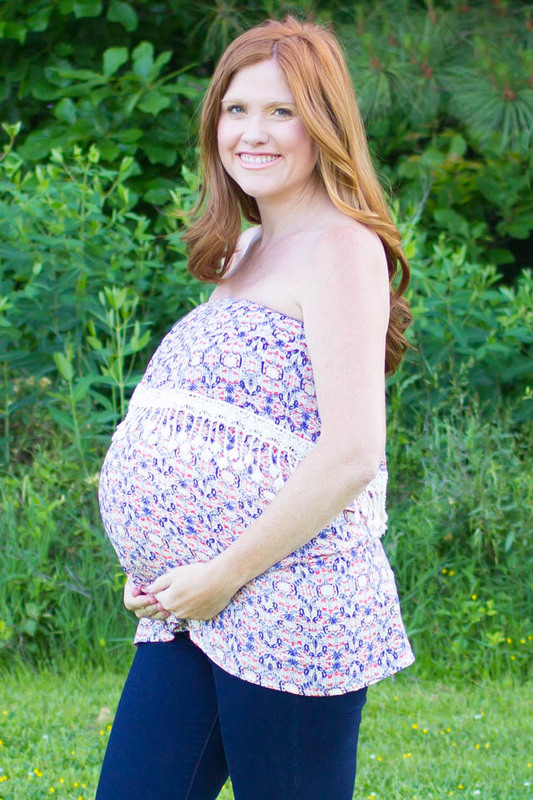 Then I visited their website, & changed my mind immediately, they have some of the cutest maternity items I have ever seen! They are so many fashionable options that you would find in other stores, all on trend with what’s currently in style (like these tassels on this top, I can’t get enough of a tassel detail right now!). They sent me three pieces, the dress I wore in yesterday’s 39 week post, the top above, & this maxi dress I plan to share pictures of soon! 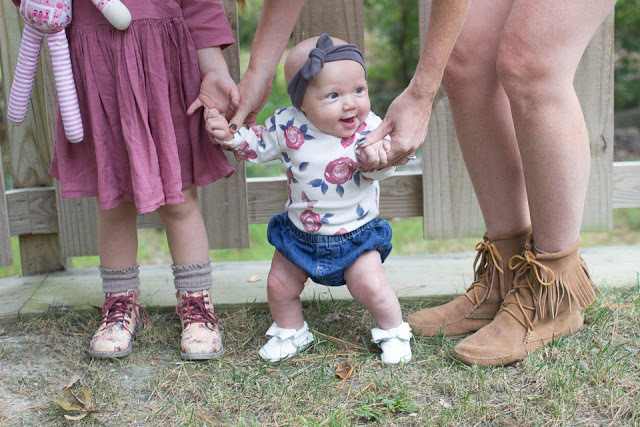 All three are super comfortable, something I feel like is so important to moms all the time anyways, & that becomes extra-important when you are growing another human. I love, love the fact that all three will also work once baby girl is here, they are stretchy enough that they won’t look awkward once the big belly is gone but won’t be too tight on the little belly that I know will remain for a while. 😉 And I can nurse in them easily, especially in the ones that are strapless, something that will be key in the summer months to come! *Pink Blush sent me these products to review but did not compensate me for this point. All thoughts & opinions are purely my own.